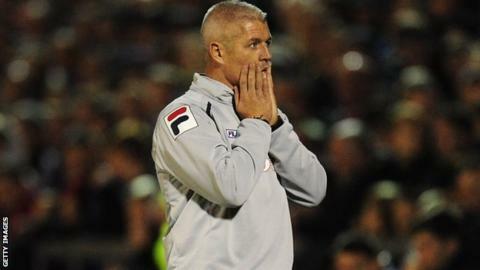 Carlisle boss Graham Kavanagh says his team are in a "relegation dogfight" because they lack mental strength. Kavanagh, 39, became caretaker boss in September after and won all three games in charge. The run but since then they have won just one of nine games in all competitions. "I had my sights much higher up that League One table, but after how well we started I forget just how mentally fragile this group is," said Kavanagh. On Wednesday, Carlisle lost at League Two Fleetwood in the Johnstone's Paint Trophy. Kavanagh made five changes to the side that and changed to a 3-5-2 formation. "It was a mistake," he told BBC Radio Cumbria. "I gave players the opportunity to impress and quite clearly they didn't." A run of one win in six league matches has seen Carlisle dragged to within three points of the relegation zone with 15 games played. On Saturday, they face Crawley Town and will move level on points with the Red Devils should they emerge victorious. "With the Crawley game in mind, I looked at how well we did when I first took over and thought it was down to freshness, which is why I changed things [against Fleetwood]," Kavanagh explained. "But it's not that, it's bravery. We need players to get on the ball and show some courage because, let's get one thing straight, playing like this we're in a relegation dogfight."